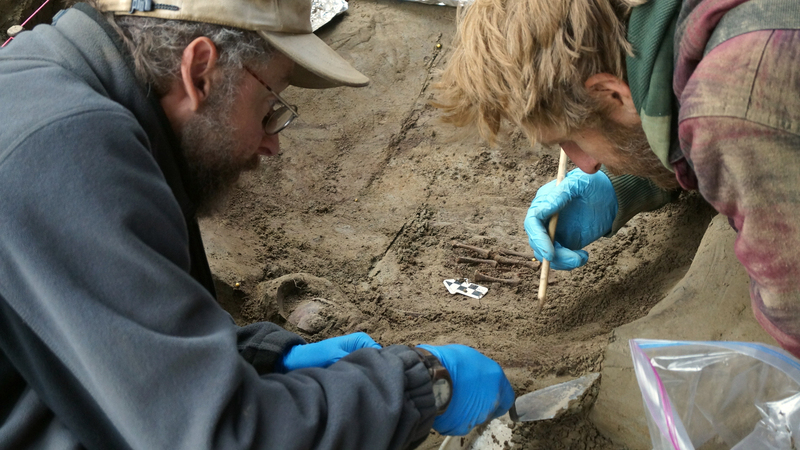 The skeletons of two Ice Age infants discovered at the Upward Sun River archaeological site in central Alaska are the earliest human remains ever found in northern North America. The presence of grave goods is also unprecedented for an infant burial of this era. The remains date to about 11,500 years ago. By analyzing tooth eruption sequences (the stages of the teeth growing out of the jaw), archaeologists were able to determine that one of them is a very young infant, between six and 12 weeks old, while the other was a neonate above 30 gestational weeks, so it was either stillborn or born too premature to live. These are the youngest individuals from the late Pleistocene to receive a formal burial found anywhere in North America. The only discovery that comes close is the child buried at the Late Clovis Anzick site in Montana around 13,000 years ago, and he was two years old at time of death. It’s rare to find burials of very young infants from highly mobile foraging societies because they didn’t stay in one place for long so there’s no central location like a cemetery and the odds are slim of encountering individual burials even of larger humans. The Upper Sun River site was a residential campsite, not a dedicated burial ground, and yet, three individuals were found buried there within the same feature: the two inhumed infants with grave goods, and a cremated three-year-old with no grave goods. That’s another thing that is unique about this discovery. Archaeologists found evidence of six different occupations of the site separated by hundreds or thousands of years. All but one of them were short-term camps occupied for no more than a few days while people hunted small game (squirrels, hares, ptarmigan) and fished the plentiful summer salmon in the nearby Tanana River. They’d take their harvest back to the base camp and cook it on hearths. The third occupation is the only one that had a longer-term presence. In addition to 10 cooking hearths, the third occupation features the remains of a dwelling and the burials. Because of the undisturbed faunal and lithic material excavated from the context of the burials, it seems the two infants were buried at the same time. The cremated remains were buried later (they were found first, in 2010; the infant remains were found last year about 16 inches beneath the cremation) but all three were either buried during the same summer or in subsequent summers. Radiocarbon dating confirms that the lower and upper finds are contemporaneous. 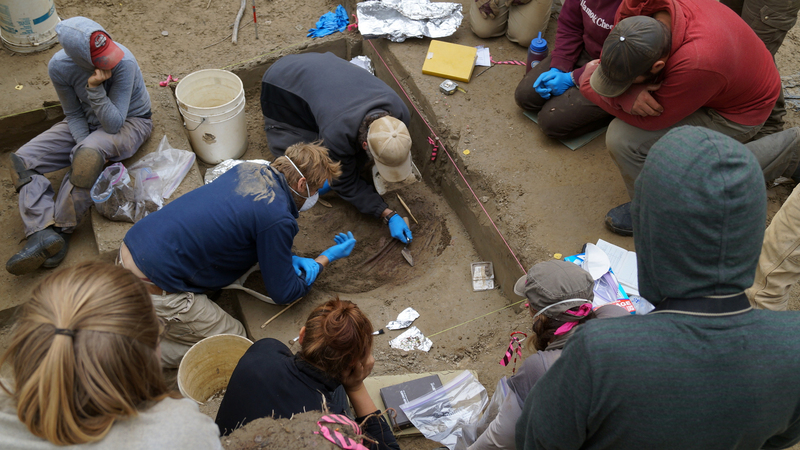 Given the consistency of the faunal remains in the ground fill and in the hearth that tops the burial pit, the third occupation base camp was populated by the same people. They could have been the one band or maybe even one family. Archaeologists are optimistic that they’ll be able to retrieve testable samples of nuclear, mitochrondrial and Y-chromosome DNA from the remains which should tell us whether they had a familial relationship. Since the double infant burial and the toddler cremation were done by the same people around the same time, there is no obvious reason for the differential treatment of the burials. It wasn’t a seasonal accommodation — frozen ground in the winter forcing cremations — because all three burials happened in the summer. There may have been a situational distinction — who was present for the burials, say — or perhaps a religious or cultural one. The grave goods and funerary customs in the double infant burial are extensive. Archaeologists unearthed four antler rods, foreshafts to which projectile points would have been hafted, decorated along the whole length with geometric abstract incisions. This too is unprecedented. There are some scratchings or possible ownership marks on other paleo-Indian foreshafts, but these are the first ones found with the whole length decorated. Two stone projectiles, dart or spear points, were found placed at the end of two of the rods, exactly where they would have been attached with animal sinew that has now deteriorated. That makes these the earliest hafted shafts discovered in North America, and the first concrete evidence that the foreshafts were topped with stone points. The entire pit and its contents were covered with ochre, a common element in pre-historic burials most likely due to the association of red with blood and therefore life. The bottom of the pit was lined with ochre, all of the grave goods were coated in it and all of the bones. The articulation of the infant skeletons — knees drawn to the chest, arms folded — suggest they were wrapped in that position before burial. Over time the wrappings disintegrated and the ochre in the pit then covered the bones. [University of Alaska Fairbanks professor Ben] Potter and his colleagues note that the human remains and associated burial offerings, as well as inferences about the time of year the children died and were buried, could lead to new thinking about how early societies were structured, the stresses they faced as they tried to survive, how they treated the youngest members of their society, and how they viewed death and the importance of rituals associated with it. “Taken collectively, these burials and cremation reflect complex behaviors related to death among the early inhabitants of North America,” Potter said. This entry was posted on Thursday, November 13th, 2014 at 11:03 PM	and is filed under Ancient. You can follow any responses to this entry through the RSS 2.0 feed. You can skip to the end and leave a response. Pinging is currently not allowed. I’ve been waiting for your take on this, Livius, knowing that you could put it into context. Good coverage. I’m looking forward to the genetic analysis as well as more on what the gravegoods can reveal about the culture of the people who buried these children. I can’t help but think of the woman or women who gave birth there and lost their babies so quickly. BTW, I doubt camps were random, though placement may have varied slightly. People then as now returned to the same areas as they made their rounds through the seasons.